I’m not a science-fiction fan. My relationship with Famous Monsters of Filmland consisted of flipping through it at the newsstand maybe twice as a kid and deciding not to buy it. 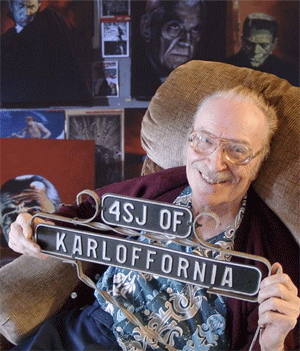 But I’m still saddened by the death of Forrest J. Ackerman, one of the first people on the planet ever to think of himself as a fan (starting circa 1926, when he was ten years old)…and a fan until the end. I knew Ackerman from his San Diego Comic-Con panels, which I made a point of attending and found consistently delightful. Forry repeating himself and not always hearing the question was a better representative of what Comic-Con should be than an infinite number of Kevin Smith panels or fawning previews of movies that deserve nothing but pity. I mean it when I say that the fact he won’t be at the con next year–probably, although I’m not assuming anything, since you never know–is a fairly major argument against making the trip and fighting my way through the crowds. And here’s my Forry story. It takes place about five years ago at the breakfast buffet in the basement of the Marriott next to the San Diego Convention Center. I’m there with a bunch of Apatoons friends. We notice that Forry has arrived–looking distressingly feeble, in a wheelchair pushed by some sort of caretaker. He looks so incapacitated, in fact, that it’s a surprise he’s out and about. …and then Forry bounds out of his wheelchair, joins the buffet line, and begins serving himself a hearty breakfast.